We thought it would be a good idea to open this blog discussing exactly what the title suggests: the cardinal virtues of game design. And, specifically, the elements that make games such an exciting, vibrant art form to us. One of the most frustrating things about games-as-art discussions is the way that so many critics try and use the standards of other mediums– “why is there no game with a story as good as Citizen Kane?” is a story that comes up depressingly frequently. Citizen Kane is brought up, of course, because it’s a masterpiece of cinema. The cruel irony here being that Kane isn’t a masterpiece for its narrative, but for its mastery of the medium of film: the cinematography, the gorgeous visuals, the use of techniques impossible to replicate outside of film to tell the story. Asking about gaming’s Citizen Kane is as futile a proposition as asking why no film can tell a story like Beckett’s The Unnamable or why Jay-Z can’t make a song as beautiful as the second movement of Beethoven’s 9th Symphony. Instead, we want to look at elements of games that are unique to their medium, and at some specific games that embody these virtues. There’s art here, not just in the artistic elements of design, but in the core game. The great moments of a game– the thrill of pulling off a well-executed stunt, the joy of actively piecing together a story through the environment, the power of having a direct hand in shaping the narrative of a game –are triumphs of their medium as much as the beautiful language of a great poem or the evocative visuals of a great film. It is not always a magic that translates between mediums. Satisfaction is where the core mechanics of the game come into play. It’s not the satisfaction of a narrative payoff, it’s the satisfaction of a job well-done. In a satisfying game, every action the player does– from the most basic attacks to the biggest events– feels simultaneously challenging, skillful, and rewarding. The player feels constantly challenged but never overwhelmed, and should always feel empowered by their skills and rewarded by the game. This can be very small-scale– the hard-kicking, enemy-destroying, controlled explosion of a shotgun in Doom makes every shot beautiful and rewarding –or become the core principle of the game, in the way that World of Warcraft and other MMOs put the player in a Skinner Box of continual challenge, stimulus, and reward. At its core, satisfaction is the “game” of a game– it’s no accident that games like Pong or Space Invaders, despite their lack of plots, art, or freedom, are what define the medium. 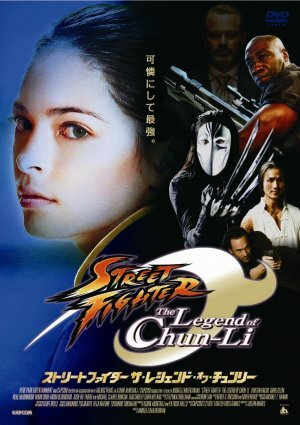 (It also says something that, to represent this element, both of us chose games by Capcom– a company that has always placed a huge emphasis on challenging and over-the-top fun). I’ve literally done this about ten thousand times and it’s still fun. I will always hold up Resident Evil 4 as one of the best video games ever made. It’s a high-water mark for the medium as a whole. I don’t mean in terms of the story (which is Roger Corman-level silly and campy), or even in terms of the visuals (creative environments, some of the best graphics of its generation, enemy design ranging from simply good to the absolute beautiful horror that is the Regenerators). It’s perfect because it never stops being satisfying. Every weapon in the game, be it the ratatat submachine gun to absolute battering ram of the Ruger Broomhandle pistol, looks, feels, and sounds unique and interesting. The game’s combat system is built around not just encouraging, but forcing the player to pull off neat and rewarding tricks– the enemies are slow-moving and ammo is rationed, pushing the player towards head- and knee-shots, which in turn lead to visceral hand-to-hand attacks. Just moving in this game is satisfying, as the controls allow you to sprint forward, hop a fence, stop on a dime, quickly spin 180 degrees around, ready a headshot, and immediately put a pursuing enemy down, all using simple and intuitive controls. Special mention has to be given to the game’s use of quick-time events, which RE4 helped to pioneer (along with God of War). 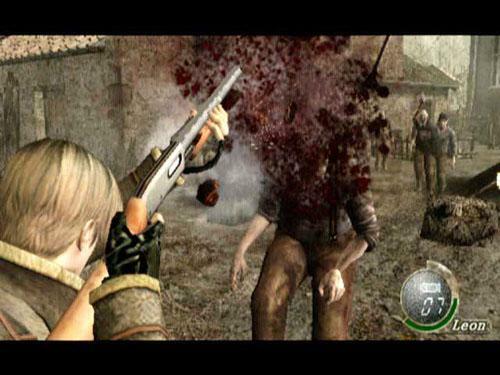 Whereas in many games these feel like a crutch for cutscenes, RE4 uses them both in and out of regular gameplay, and they’re frequent and easy enough to give the player a sense of power– struggling out of enemy attacks, quickly dodging a projectile, stabbing a spider-shaped abomination in his mouth-eye. There’s not a moment in the game where you’re not about to do something cool, and the game (and, credit where credit’s due, Shinji Mikami) always makes you feel like you’ve earned it. You, too, will want to be The Guy. Despite what you’d expect from someone who grew up playing Nintendo, I have no real feelings of nostalgia for Mega Man 2. I first played the game over a decade after its initial release, but I’ve only grown to appreciate it more as a game designer over the years. It has a few missteps (like that turret boss), but the mechanics, overall, are rock-solid. Since this is a Mega Man game, I’d better address the music first. The soundtrack is the best music the NES ever had. 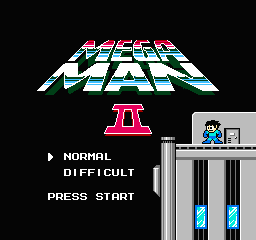 Each theme perfectly compliments its stage– Bubble Man’s peaceful, lethargic theme goes well with slower speed of Mega Man’s actions while underwater while the driving, forceful tune of Quick Man’s stage makes running the infamous laser gauntlet all the more frantic. The pairing of great music with complimentary gameplay will always be a rewarding experience for me. It makes the music not just a soundtrack, but an aspect of the level design. In Mega Man tradition, Mega Man 2 lets you tackle the first 8 levels of the game in any order you want, but you’ll have to figure out which path through them gets you the right weapons to use against the upcoming bosses. Letting the player constantly build up their arsenal for the first portion of the game this way is a great incentive to keep playing–it offers major, and constant, rewards for progress– and figuring out which weapon a boss is weak against and completely destroying him with it is always incredibly satisfying–it gives the player a sense of mastering the game’s strategy and learning how to beat it, not simply accumulating power. While the above mentioned mechanics are present in all Mega Man games, Mega Man 2 nails this formula the best, and I could talk about why for the rest of this blog. In the end, it all boils down to exquisite level design, which is really why Mega Man 2 is so satisfying to play. It’s just such a well crafted experience (aside from the previously mentioned turret boss), with a perfect and diverse selection of weapons, enemies and obstacles to give the game just the right level of challenge. This is the one that a lot of the more intellectual game critics like to talk about, and for good reason: if you’re crafting a narrative in games, the fact that the player is your protagonist is a fairly important feature. A player’s immersion is the sense of being in the world, the sense in which the game world feels like an interesting and rich environment. It’s the aspect of games which benefits the most from great art design, great sound, and great writing. Games which are truly immersive are the ones in which the player’s happy to poke around in corners, scrounge for expository text, look for secrets, or just admire the scenery. 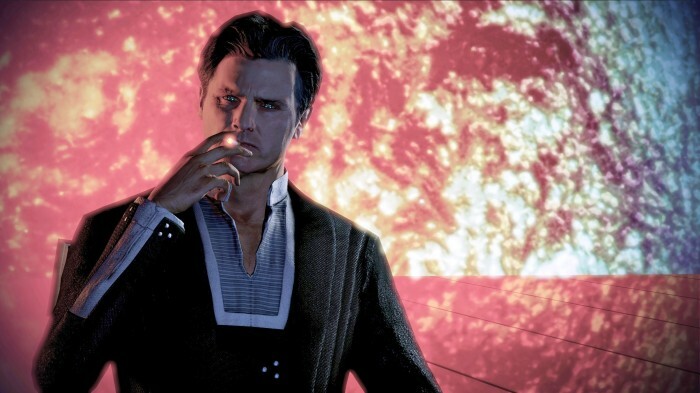 It can be used to huge effect to create an emotional response in the player; think of the infamous reveal at the beginning of Bioshock’s third act, and how much scarier and more sickening it was to find that you had been manipulated and that your life was a lie than it would be for a non-player protagonist– and how much little impact this would have had if the game hadn’t drawn the player in and made us believe in its world through a lush, detailed, and emotionally-charged setting. An immersive game is a game we lose ourselves in. 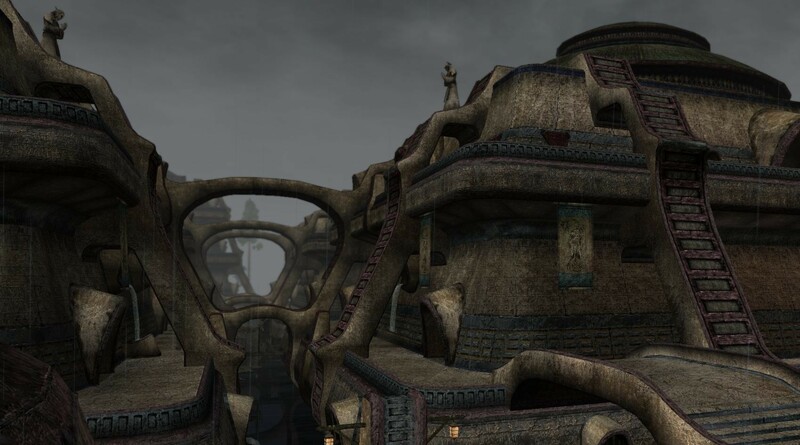 The City of Vivec, which you will never ever see every inch of. When I first played Morrowind, at the age of 13, I was blown away. It was the first experience I’d had with anything like a sandbox or open-world game, but what amazed me wasn’t just the size of the world or the fact that every person in it could be spoken to, made an enemy or friend, or killed (or that legendary theme song, which even today makes me tense up with anticipation). It was things like the buildings made from the hollowed carapaces of giant crabs, the bookshelves full of books I could read, the incredibly complex politics and religions of the island of Vvardenfell, and the feeling of really being in a strange and fully realized land. Sadrith Mora, the inhabitants of which you will never like (because they’re Objectivist wizards). villages, but most of your time will be spent in adobe buildings, houses carved from giant mushrooms, the aforementioned shell-buildings, or just staring in wonder at the colossal fleas or weird T-Rex/cow hybrids that populate the landscape. It’s a world with a huge amount of creativity on display, and it throws the player in headfirst to explore and acclimate themselves with the world. There are few games, especially nowadays, that completely dispense with hand-holding and say “here’s your world, here’s the name of someone who might help you, here’s twenty bucks– go have fun.” And I can’t think of another one that combines that sense of vast potential with Morrowind’s almost obsessively-intricate backstory, creative art design, and seemingly-infinite amount of details, hidden treasures, secrets, in-jokes, and sidequests. I’ve probably clocked more hours in it than any game before or since, and a huge amount of that time was just wandering the cities, studying up on history, and going for nature walks. 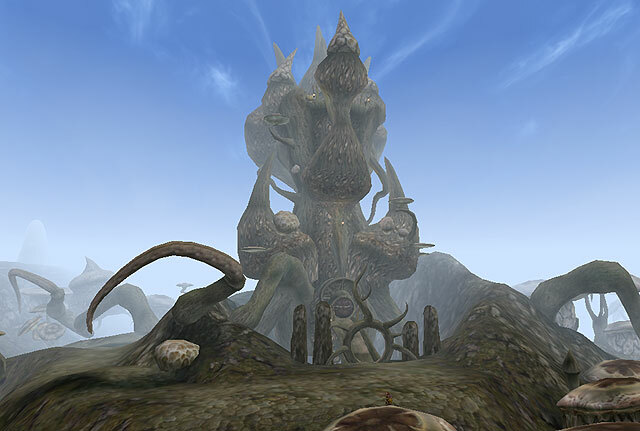 Playing Morrowind, it’s hard not to feel like you’re stepping into another world. The distinction between Colossus and landscape can be pretty blurry. 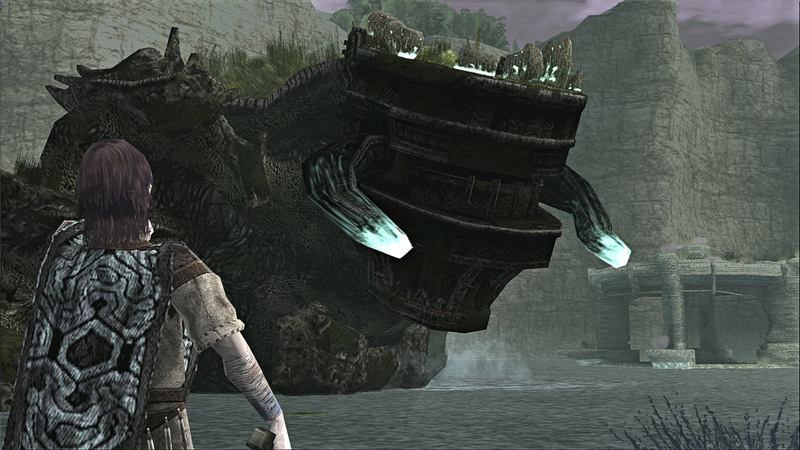 From the moment I started playing Shadow of the Colossus, I was impressed with the presentation of its world. I loved the high-contrast lighting, the washed-out colors, and the subdued (or nonexistent) music when riding from place to place, all further heightening the sense that you are all alone in this vast landscape. All of this caught my attention and drew me in before I ever reached the core gameplay. The sixteen colossi themselves are fascinating to look at, as nearly all of them have their own distinct, bizarre, and sometimes off-putting appearance. They may slightly resemble mythical creatures, but never to the extent that they look familiar at first glance (you’ll never say “that’s a minotaur” or “that’s a dragon”). And yet, as strange and alien as the colossi look, there are certain common features many of them share (like a stone faceplate, piercing orange eyes, the white markings indicating their weak points) that serve to make them all the more intriguing, since it makes you wonder what these creatures actually are and where they came from. It hints at a story you’ll never find out, again making the player feel so much smaller and younger than the world they’re invading. The architecture– what little of it remains in this now uninhabited land — has a very primitive look to it. While many fantasy games have distinctly medieval buildings, the structures in Shadow of the Colossus have a truly ancient feel to them and and evoke the same kind of strangeness that we feel when looking at the ruins of a Mesopotamian or Aztec city. Once again, the world feels unfamiliar and you’re left without a point of reference. Basically, the point I’m driving at here is that Shadow of the Colossus is immersive because the world it creates is unique and interesting. You could have a perfectly executed game about slaying sixteen dragons in Tolkeinland #35 but I wouldn’t find it as immersive because I’ve played many games in nearly identical worlds and would find it much harder to become interested, and the game would have been forgettable because it wouldn’t have had the beauty, strangeness, and emotional power that impressed so many people. Agency is the player’s choice and freedom– it’s what makes them a player, rather than a viewer. A player’s agency is why, if you tape the same person playing the same game on two different days, the recordings will still look different. While, at its most basic level, agency can boil down to the choice of whether to look to the right or left, a game that handles it well will give the player free and meaningful choices. This doesn’t have to translate to a moral choice system, open-world gameplay, or WRPG-style character creation (although these are all expressions of player agency). At its core, agency means the player has a multitude of ways to approach most situations. Shooters approach this by giving the player an arsenal of varied weapons and letting them decide which fits their playstyle, survival horror games by forcing the player to ration their supplies and decide when to fight and when to run. Most importantly, these choices should feel meaningful— having twenty guns to choose from isn’t satisfying if all of them are equally effective, and being able to make extreme moral choices is empty if no one ever reacts to it and the world never changes. I really want a Mass Effect game that’s just me and Mordin going to bars and having fun. (I wanted to focus specifically on ME2 for this entry, both to avoid getting drawn into the endless bickering about Mass Effect 3′s ending and because I’m going to draw a specific example from it later). Mass Effect 2 isn’t perfect in this regard, because this is an aspect of the medium games are still struggling with pretty hard. But it does some things very, very well. The player’s character customization is in-depth and important– the various classes play radically differently, and can be further customized to match the player’s style. It also gets a ton of credit from me for eschewing the traditional good/evil slider and instead giving the player bars which measure what type of badass they are; think of the Paragon/Renegade choice as being how much your Shepard is John Wayne or Lee Marvin, respectively. It also makes several of these choices have long-term consequences– minor characters from the first game will pop up in this one, characters you save in the tutorial mission will vouch for your integrity when you wind up in court later, and, for one of the first times in RPG history, blowing off a crucial mission to do sidequests will result in people dying horribly and you being rightfully chewed out for taking your sweet time saving them. It’s easy to be evil when the devil is Martin Sheen. That last point is what makes this game a real triumph of player agency for me– unlike so many other games with choice systems, it makes its choices hard. Even if you commit at the beginning to a pure Paragon/Renegade playthrough, there are going to be times where the Paragon’s mercy and understanding feels like a waste of breath, or where the Renegade’s expediency and refusal to compromise will seem cold, or even cruel. This is at its best in the mission “Old Blood,” probably my favorite hour or so of gaming in 2010, in which you accompany Mordin Solus (the ship’s doctor) in following up on the black-ops bioweapon work he’s still riddled with guilt over. The mission from start to finish puts you in a moral gray zone, constantly asking you how far your commitments to expediency or understanding go, and it’s one of the few moments in the game where I really couldn’t tell you what was “right.” Mass Effect can get pretty soap-operatic with its writing and morality from time to time, but “Old Blood” is about as good as any pop-sci-fi gets and most of its power comes from forcing the player to take an active role in the moral conflict, to make it impossible to leave without innocent blood on your hands. 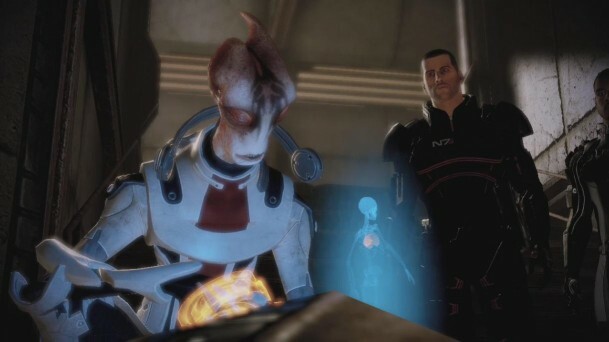 That mission, and all the other moments in the game when related moral conflicts and crises get raised, are about as free as I’ve ever felt playing an RPG, simply because it was hard to find a choice that was unjustifiable, and because every choice felt like a momentous one both for the game world for Shepard and Mordin’s souls. Liam Neeson will be very disappointed in your actions. Fallout 3 is the game that completely embodies agency for me. Nearly every scenario you’re placed in can be completed in a variety of different ways, which actually make primarily investing in skills like speech and science seem like viable alternatives. The player’s choices in character creation become meaningful, because committing to a smooth-talking scientist opens up some paths and shuts off others. Even within combat, there are plenty of different types of weapons to specialize in, and which specialty you choose actually affects the way combat feels. While many games offer these kinds of choices, they often don’t radically change the way you experience the game. In Fallout 3 though, my first playthrough as a combat heavy, dumb-as-bricks cannibal berserker (who obeyed the orders of anyone wearing a fancy suit) felt totally different than my second playthrough as a pragmatic and opportunistic scumbag with a fondness for laser weapons, even though I focused on the main quest and many of the same side quests with both characters. 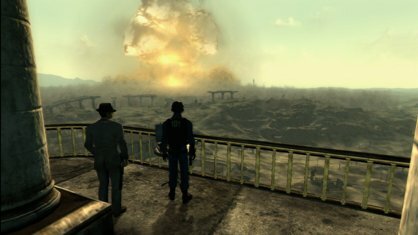 Many games these days feature tacked on moral choice systems that more often than not feel like a hastily added gimmick, but Fallout 3 is one of the few games I’ve played where choice really feels like a part of the core gameplay. From the moment you’re born in game, you start making a series of choices that define who your character is– whereas in New Vegas, the choices are primarily about what sides you take, in Fallout 3 they’re about who your character is as a person. There’s never a moment where you feel, “this is the choice the designers want me to make.” The story of your character’s life is formed through the choices you make, which gives the player more of an authorial role than any other game I’ve played (to the extent that major towns can be completely wiped out). That’s true agency.